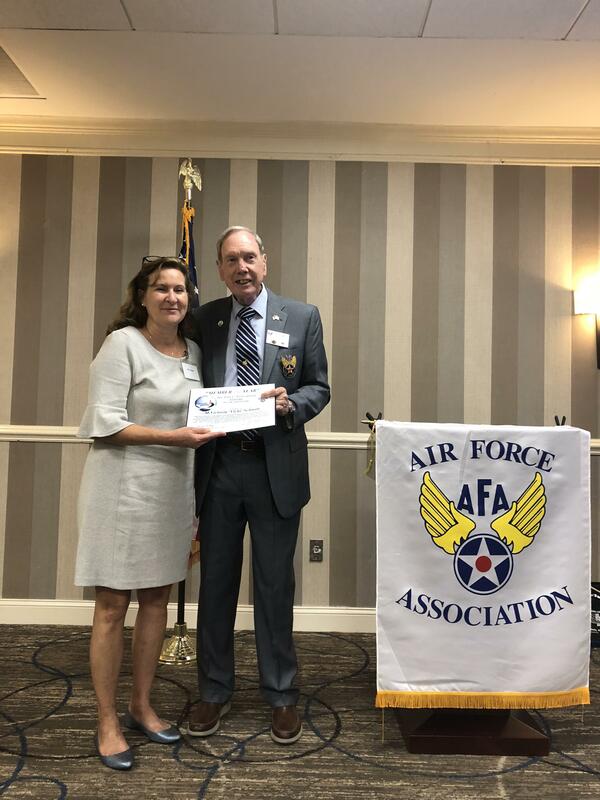 Vicki Schmitt, Chairman of the BK Science Department is the recipient of the 2018 Member of the Year Award presented by the Air Force Association Falcon Chapter #399. Mrs. Schmitt, is an active supporter of the chapter’s Aerospace Education Programs which are designed to promote STEM education. She also advises the Chapter’s leadership team on STEM activities at the high school level and is instrumental in providing outreach to the community through Bishop Kenny programs. Mrs. Schmitt has been teaching at Bishop Kenny High School for the past 22 years and has been the Science Department Chair for 14 years. She teaches AP Chemistry and Chemistry I Honors and founded STEAM Day at BK three years ago to promote middle school engineering. She is on the core team for the Northeast Florida Regional Science and Engineering Fair, and her students participate in the Army Corps of Engineers annual high school competition.